Nasdaq Dubai has launched futures trading on the shares of 12 leading Saudi Arabian companies, in a major move that enables investors to gain from changes in the Saudi-listed companies’ share price by trading the futures on Nasdaq Dubai. The futures are designed to increase the appeal of regional markets to international investors. They can be used as tools for hedging existing positions or taking a view on market movements, with leverage to maximize the outcome of their trades. Investors can make gains from futures whether the underlying share prices rise or fall. The 12 companies are listed on the Saudi Stock Exchange (Tadawul) and include some of the Middle East’s largest businesses, with a combined market capitalisation of SR794 billion ($212 billion). They are: Saudi Basic Industries Corporation (SABIC); Al Rajhi Bank; Alinma Bank; Almarai Company; Dar Al Arkan Real Estate Development Company; Etihad Etisalat Company; Rabigh Refining and Petrochemical Company; Saudi Arabian Mining Company; Saudi Cement Company; Saudi Electricity Company; Saudi Kayan Petrochemical Company; and Altayyar Travel Group. 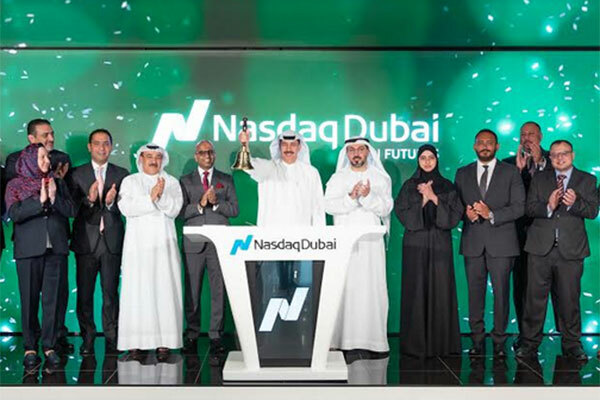 Essa Kazim, Governor of Dubai International Financial Centre (DIFC) and chairman of Dubai Financial Market (DFM), rang the market-opening bell at Nasdaq Dubai Market Site to celebrate the start of Saudi futures trading. The launch ceremony was attended by executives of leading brokerages through which investors can trade futures on Nasdaq Dubai including Integrated Securities, Brokerage House Securities, Menacorp, Al Ramz Capital, Al Safwa Mubasher, Daman Securities, EFG-Hermes UAE, Arqaam Capital and SICO UAE, as well as by Mubasher Financial Services and Shuaa Capital. Nasdaq Dubai first announced its plans to launch Saudi equity futures in May 2018. The futures are traded on Nasdaq Dubai in Saudi riyals (SR), which is the currency of the underlying shares. The exchange launched UAE futures trading in 2016 with single stock futures on seven companies. With more UAE companies added since then plus today’s addition of the Saudi contracts, Nasdaq Dubai now offers single stock futures on a total of 29 leading regional companies. In 2018 the exchange also added futures on Dubai Financial Market’s DFMGI share index as well as the ADI index of Abu Dhabi Securities Exchange. It will add futures on MSCI’s UAE share index later this month.